Nothing like a real good spanking of your opposition on a weekend. Today’s game was a stark reminder to everyone who has written off Arsenal as genuine title contenders. It was just Southampton, they may say, but here was a team that nearly shook off the Manchester clubs. Arsenal had a surprising lineup on the day, different from what I had predicted earlier in the day. Olivier Giroud was dropped to the bench and Gervinho was given a start. I had expected him to be on the flanks, but he had started centrally, with Podolski on the left. There was a start as well for Francis Coquelin who was preferred to Aaron Ramsey in place of the injured Abou Diaby. Alex Oxlade-Chamberlain kept his place on the right flank, while Walcott and Giroud had to contend with a place on the bench. There were no changes to the Southampton side which played Manchester United couple of weeks back. Uruguyan Gaston Ramirez, the Saints new signing from Bologna started from the bench. Arsenal hit the gears very early on in the game, with Saints looking set up for containment in the opening exchanges. Lukas Podolski seemed to have lost possession, but immediately regained it and made a darting run in space afforded to him. He played a perfect pass for the onrushing Kieran Gibbs who aimed to give it back to the German, but instead found Southampton goalkeeper Kevin Davis in the way. He could only glance the ball on to the bath of Jos Hooived, who couldn’t react quickly enough and the ball was in the back of the net, for an own goal. Per Mertesacker had a header on target but was saved by Davis. Gervinho then made a fine run, after being played through post some fine interplay between Cazorla, Gibbs and Podolski, but his shot went wide. I am sure all of us watching the game instantly assumed that Gervinho again had forgotten to put his shooting boots on. How that was to change. Former Aston Villa, Fulham and Rangers midfilder Steve Davis then needlessly clattered into Francis Coquelin. Santo Cazorla and Lukas Podolski lined up to take it, and it was the German in the end who eventually took it. And, it was a peach of a free kick, as it flew into the net, with Davis poorly positioned. The German was already warming up to the Arsenal faithful with his work rate all over. Soon enough, Arsenal were running away with the game. First Mikel Arteta played a delicious pass into the path of Gervinho, with Saints defenders too close to each other. It was the simplest of finishes, and thank god, the Ivorian did not make us all cringe with a miss this time. He looks to be getting his confidence back slowly, having netted for his country during the recent qualifiers. Kieran Gibbs got his second assist of the game when his attempted cross stuck Nathaniel Clyne and flew into the far corner, with Southampton’s defenders unable to react. Arsenal had scored thrice in the space of 6 minutes. It was not all one way traffic, though. A blooper from Wojciech Szczesny allowed Daniel Fox to finish from close range, to make it 4-1 at the interval. Southampton seemed more composed in the second half, probably the aftermath of a stern team talk from Nigel Adkins. They could have made it 4-2 when their goal machine Rickie Lambert put an effort wide. The Saints enjoyed some periods of possession, but with little to show for it. Arsenal on the other hand, too were keen on keeping the ball, rather than bomb forward for more goals. However, it changed when Aaron Ramsey was bought on for Francis Coquelin in the 66th minute. This meant Mikel Arteta dropped back, allowing Ramsey and Cazorla to dictate play in midfield. The Welshmen had instant impact, when in one motion, he collected the ball, chipped the ball over Clyne, and seemed to have scored off the far post, but the ball could hit only the post. 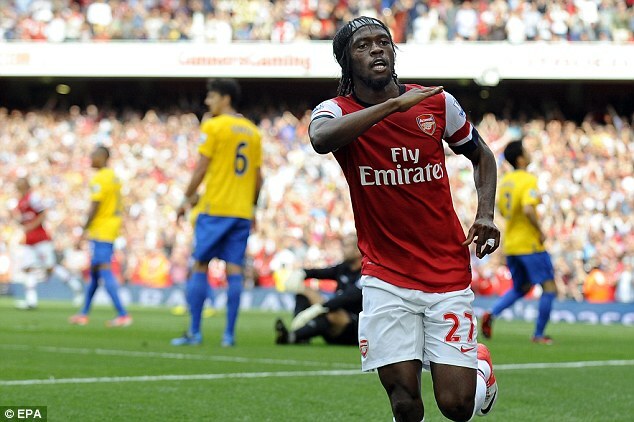 Luckily, Gervinho was on hand, and he tapped home Arsenal’s 5th. Clearly, the manager was satisfied, and he sent on Theo Walcott and Olivier Giroud in place of Gervinho and Lukas Podolski. They almost had an impact when Walcott was sent clear, but failed to provide a pass at the right time, to Giroud who was waiting in a scoring position. Alex Oxlade-Chamberlain had a go himself at goal, but it was narrowly wide. However, Arsenal did get their 6th when Southampton failed to clear the lines off a Vermaelen strike, giving Walcott plenty of time to slot home a left footed goal. Giroud and Chamberlain had further opportunities, but missed narrowly. So, positives. Well, who needs Batman Robin when you have Robin Po-goalski?? Well, the German was yet again impressive, with his work rate. The fact that the goals are being shared all round is a good sign.Santi Cazorla was at his brilliant best again. He dictated most of the game play, and found runs of teammates. What a signing he has been so far. Gervinho too looked very sharp today. Chamberlain still looks a bit rusty though. Defensively, we were okay, we didn’t give away too many chances. However, the goal that was conceded could have been totally avoided. There were discussions regarding having Mannone back, but Szczesny is number one. So, end of. A bad moment shouldn’t really knock him off the number 1 spot. Jenkinson again was very impressive, and so was Gibbs. Next up, in the Premier League is a daunting trip to Eastlands to face Manchester City, but before that we have to face French champions Montpellier in France in the Champions League opener. Get behind your team and your manager!